The weak variant of the Hanani–Tutte theorem says that a graph is planar, if it can be drawn in the plane so that every pair of edges cross an even number of times. Moreover, we can turn such a drawing into an embedding without changing the order in which edges leave the vertices. We prove a generalization of the weak Hanani–Tutte theorem that also easily implies the monotone variant of the weak Hanani–Tutte theorem by Pach and Tóth. Thus, our result can be thought of as a common generalization of these two neat results. 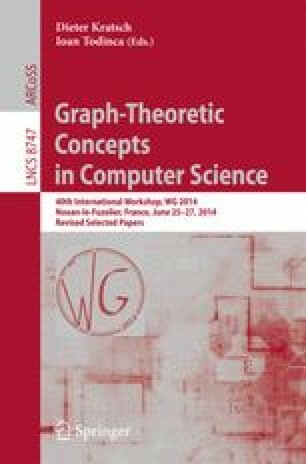 In other words, we prove the weak Hanani-Tutte theorem for strip clustered graphs, whose clusters are linearly ordered vertical strips in the plane and edges join only vertices in the same cluster or in neighboring clusters with respect to this order. Besides usual tools for proving Hanani-Tutte type results our proof combines Hall’s marriage theorem, and a characterization of embedded upward planar digraphs due to Bertolazzi et al. The author gratefully acknowledges support from the Swiss National Science Foundation Grant No. 200021-125287/1 GIG/11/E023. We would like to express our special thanks of gratitude to the organizers and participants of the 11th GWOP workshop, where we could discuss the research problems treated in the present paper. In particular, we especially benefited from the discussions with Bettina Speckmann, Edgardo Roldán-Pensado and Sebastian Stich. Furthermore, we would like to thank Ján Kynčl for useful discussions at the initial stage, and Gábor Tardos for comments at the final stage of this work.